One of the most effective changes we have made is moving to more dumbbells and kettlebells and less barbells in our large group classes. I want to share with you why we’ve made the changes, and how this has benefited our members. Whenever we do make changes at Hybrid Fitness, we always keep the most important thing in mind – and that is… as our membership as a whole, what is the main goal? Is it to be power lifters? Is it to be as healthy as possible? Is it to look better? Is it a combination of these things? And improve in those five categories in a safe manner. While there are certainly some exceptions to this (we have some members who want to get super strong), we still have to keep in mind who we are. We are a gym for the every day person who wants to get in better shape and can do that In a fun, judgement-free environment. Now don’t get me wrong, we have some strong men and women at our gym. We certainly do prioritize resistance training. The way we are doing it, however, has changed. Keeping our main goal, fat loss, in mind – here is the reasoning behind our programming changes. Bottom line, dumbbells are safer. In a large group setting of 10+ people where you may or may not have a spotter, you are not going to get pinned under a bar if you don’t complete your repetitions. Furthermore, the majority of dumbbell movements are much less technical than barbell movements. The more technical the movement is – the more chance there is for error, and with a large amount of members in one class, it is very hard to make sure everyone is completing the repetitions with proper form – especially with a single trainer. When it comes to fat loss, having your heart rate up is key. If you can keep you’re heart rate up and do strength training at the same time, you can really make some awesome progress in a reasonable amount of time. 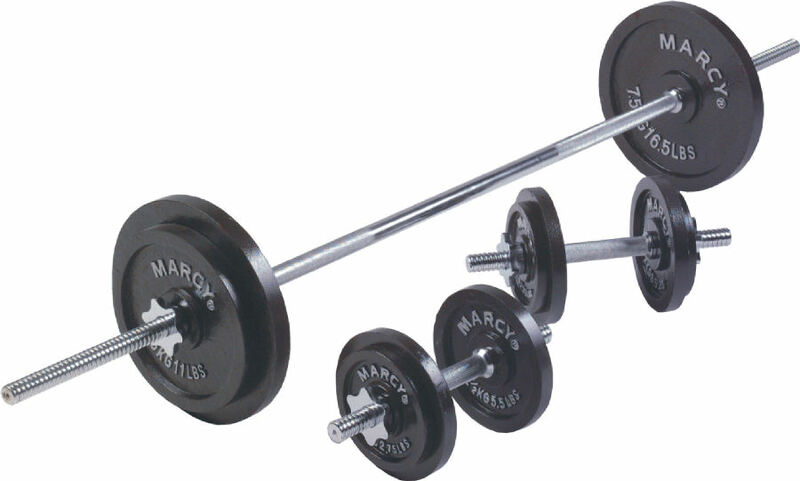 With barbells, there is much more transition time between exercises. Because you have to switch weights and put clips on, you are unable to go straight from exercise to exercise. With dumbbells, you can simply drop the dumbbells on the ground and pick up heavier ones. They are already preset and ready to go. This allows you to do more work in less time. In order to maximize barbell work, it can take a lot of hands on help to make sure people are progressing correctly. We constantly found that people would struggle with pushing themselves because of fear (a barbell for a person who hasn’t ever worked out can be intimidating), and lack of knowledge in progressing (we put in multiple efforts to educate people but it still wasn’t happening). The only time we were able to have people work optimally is when they had hands on work with a trainer – and again, with 10-15 people in a class, it’s very hard to give everyone that personalized guidance. Because many people weren’t working with the proper load, their heart rates were low, and their workouts (for fat loss) were ineffective. Dumbbells are much less intimidating. Also, to progress to a higher weight, you just pick up the ones that are five pounds heavier. Its super simple and easy for a beginner to understand. In the past few months we’ve seen some amazing progress from people who were otherwise at a stand still. Barbells can take up a lot of space, and that can be a safety problem as well as effect transition times between exercises. The we have a very narrow gym, so when someone is deadlifting, they take up the majority of the room. It limits us from doing other movements that could be more effective, and it also lets that heart rate drop back down if you’re waiting in traffic. With dumbbells, we can stack 3 movements together, and you almost wouldn’t have to move. Doing lower body exercises with dumbbells can eventually become a problem when you start to get really strong. You find very soon that you are working more of your upper body than your lower body trying to hold them. When our members get more advanced, we move them to more unilateral (single leg) movements, which essentially doubles the load to their legs. Most barbell movements are much more technical – and therefore more dangerous without proper technique and guidance. In a large group setting with one trainer, it is very hard to manage a large number of people performing these movements at the same time. For most, bottlenecking in the dumbbells will only come in the lower body, not the upper body. In this case, we are going to put an order in of trap bars. Here’s why trap bars are awesome. By using the trap bar, we can get all of the benefits of the barbell, with barely any of the downside. Even for those who want to primarily focus on strength, this program is going to be awesome. They will still be able to get stronger, still build plenty of lean muscle, and feel great. The only downside is there won’t be the traditional powerlifting lifts that come with strength training – but that is not needed. Overall, utilizing dumbbells more in our large group workouts instead barbells will make our workouts safer, more effective for fat loss, and simpler. Along with that, we’ll be adding in alternatives like the trap bar to get the benefit of heavy weight without the downsides of increased technicality, increased time in between exercises, and taking up a large amount of space.